Which TV shows are doing the best? The worst? Cancelled or renewed? Wondering how your favorite series are doing in the ratings? Here are the season average ratings of the 2014-15 network TV shows — through the end of week 41 (Sunday, July 5, 2015). ABC shows (so far): 20/20, 500 Questions, America’s Funniest Home Videos, American Crime, The Astronaut Wives Club, The Bachelor, The Bachelorette, BattleBots, Beyond the Tank, Black-ish, Castle, Celebrity Family Feud, Celebrity Wife Swap, Cristela, Dancing with the Stars, Extreme Weight Loss, Fresh Off The Boat, Forever, Galavant, The Goldbergs, The Great Christmas Light Fight, Grey’s Anatomy, How to Get Away with Murder, In An Instant, Last Man Standing, Manhattan Love Story, Marvel’s Agent Carter, Marvel’s Agents of SHIELD, The Middle, Mistresses, Modern Family, Nashville, Once Upon a Time, Primetime: What Would You Do?, Repeat After Me, Resurrection, Revenge, Rookie Blue, Scandal, Secrets and Lies, Selfie, Shark Tank, The Taste, and The Whispers. CW shows this season (so far): The 100, Arrow, Beauty and the Beast, Cedric’s Barber Battle, The Flash, Hart of Dixie, iZombie, Jane the Virgin, The Messengers, The Originals, Reign, Supernatural, The Vampire Diaries, and Whose Line Is It Anyway?. 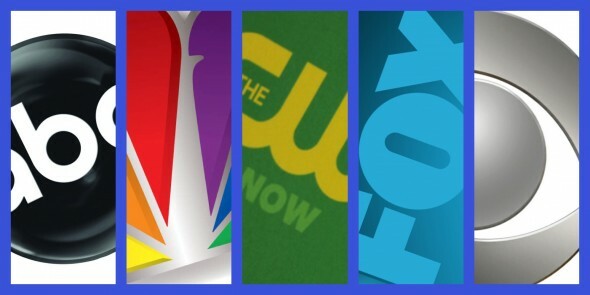 FOX shows this season (so far): American Idol, Are You Smarter Than a 5th Grader?, Backstrom, Bob’s Burgers, Bones, Boom!, Brooklyn Nine-Nine, Bullseye, Empire, Family Guy, The Following, Glee, Golan the Insatiable, Gotham, Gracepoint, Hell’s Kitchen, The Last Man on Earth, MasterChef, MasterChef Junior, The Mindy Project, Mulaney, Red Band Society, New Girl, The Simpsons, Sleepy Hollow, So You Think You Can Dance, Utopia, Wayward Pines, Weird Loners, and World’s Worst Fails. NBC shows this season (so far): A to Z, A.D.: The Bible Continues, About a Boy, Allegiance, America’s Got Talent, American Ninja Warrior, American Odyssey, Aquarius, Bad Judge, The Biggest Loser, The Blacklist, The Celebrity Apprentice, Chicago Fire, Chicago PD, Constantine, Dateline NBC, Dateline Saturday Night Mystery, Food Fighters, Grimm, Hannibal, I Can Do That, The Island, Law & Order: Special Victims Unit, Marry Me, The Mysteries of Laura, The Night Shift, One Big Happy, Parenthood, Parks and Recreation, The Sing-Off, The Slap, State of Affairs, Undateable, and The Voice. LOL. You can keep The McCarthy’s in the cancelled pile. But please rethink your wonderful cancelled shows….. FOREVER, AMERICAN ODYSSEY, STALKER, to name just a few….. But they’ll keep cartoons on for yrs. Oh and the overweight people shows! FOX…. are you kidding? You renewed New Girl with those awful ratings? Seriously? We’ve been watching a lot of AMC, TNT & USA these days.